When learning something new the first steps are always the hardest and the most important. In order to accomplish something, you have to start somewhere. 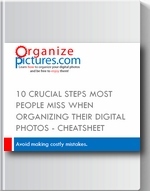 This is also the case when it comes to learning how to organize your pictures. I can talk a lot about efficient folder structures, image metadata, IPTC, XMP and other things like this. But many times I people simply ask me: how do I start organizing my pictures? I think that’s a great question. When I talk to people and tell them that I have created a website called OrganizePictures.com and it helps people learn how to organize their pictures, I usually get something like: oh, yeah I have to start organizing my pictures, I have too many. And then the next question is: where do I start? So, where and how do you start organizing your pictures? Maybe you’re a little more advanced on path to organizing your pictures and some of your friends ask you about organizing their pictures. Where do you tell them to start? When thinking about a folder structure, I ask a simple question: How do you look for pictures on your computer? Do you look for pictures from certain events like birthdays, work functions, family outings? Or do you look for pictures with certain people and emotions like I want to see a picture of my daughter wearing a red dress and crying? I am asking these questions to see if folders will be enough for their needs or if they really need to learn about adding tags or keywords to their pictures. Most people immediately answer that they’re looking for pictures taking at events. It is also true that when I ask the second question some people say that it would be very nice to be able to find a picture of their daughter wearing a red dress and crying. However, this is not most people’s concern, well at least not in the beginning. This is true, for most people it is sufficient to use events as the criterion for creating folders. And this is where I tell people to start, by following an efficient and consistent folder naming convention and structure. This involves creating a structure consisting of folders that include dates, places and descriptions in their name (Read Easy steps to create efficient folder names). I always tell people to start by organizing their folders. Most of the people I talk to don’t have an efficient and consistent folder structure. This is where everyone should start. And in particular everyone should be focusing first on the names of their folders. All right, I get this folder structure stuff. What happens next? In order to optimize your folder structure, you have to group together these nicely named folders you have started to create. If events is the main criterion for you, just like for almost everyone else, then you can group your event folders into year folders. This way you provide a logical division for your pictures and help yourself when you need to find a particular set of pictures (Read Organize your pictures in 5 easy steps). If your answer to the second question is a definite yes and it seems very important to you to be able to find a picture of your daughter crying in a red dress, then you have to use image tags. When you are contemplating the idea of using image keywords for organizing your pictures read When folders are not enough. In order for you to be able to add image tags and manage these image tags you have to pick a program to help you do that. There are a few free programs to help you insert image keywords (Picasa and XnView). Also there are also a few good commercial programs that can do a better job for you (Adobe Lightroom and ACDSee Pro 3). Use only singular for the actual keywords. Example: house, tower, park, tree. This would be instead of using words like: houses, towers, parks, trees. Use only plural for categories of keywords. Example: buildings contains keywords like house, tower. Or emotions contains laughter, sadness, screaming. You can read a lot more about Creating precise keywords for digital assets. When you need a keyword that you don’t already have, don’t just add the keyword ! First see if you can also add it to an existing category of keywords. If you don’t have an existing category (the plural words), then create a new category and then add the new keyword to that category. Now you can add the new keyword to the pictures. Just because you’re using keywords or tags doesn’t mean you don’t have to pay attention to the keywords. You have to learn how to manage your keywords just like you have to learn how to manage your folders. Always remember that you’re organizing your pictures so that you can be free to enjoy them. It’s a necessary sacrifice for future enjoyment. Thank you for your informative articles. The most difficult part of sorting images is getting started, but as the collection grows it can mean the world of difference between having them sorted or in a big mess. 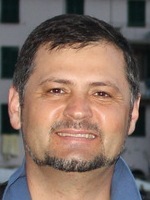 I use PixPuffin (pixpuffin.com) a very easy to use cloud based system. Very useful article! ACDSee and Lightroom are very powerful apps. But organizing is a very boring process. That’s why I use Pictomio (http://pictomio.com/Default.aspx) and BonAView (http://www.highmotionsoftware.com/products/bonaview) to make this process more interesting. This software can displays pictures in 3D like Apple’s CoverFlow.